edit: The intro was edited. I didn’t intend to offend and I apologise if I did, it seems that I could have chosen my words better. Muslims worldwide who are concerned with following the tenants of their faith now have another tool to assist them in that endeavour. Muslim Pro, combines several features found in standalone apps to become a one-stop solution to avoid missing prayers, while acting as an easy portable Quran. 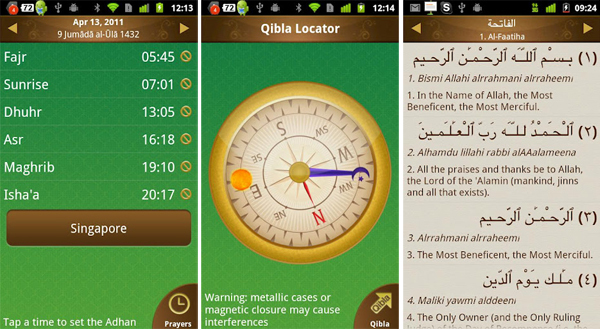 It provides accurate prayer times based on the user’s location, a Qibla locator, Quran with audio, and knows where to find Halal restaurants and mosques. The app functions across time zones and appears to have been designed with the modern globetrotting Muslim in mind; and is apparently popular across Europe and the Middle East. While Muslim Pro is basically free, there is an option to upgrade to a premium account that removes the ad banner and replaces it with a reminder to the next prayer time. Plus, 5% of the proceeds go to charity (an Islamic one naturally). It is currently available on both iOS and Android. But the developer, Bitsmedia Pte Ltd, is also working to get the app working on feature phones, while also building its own database of mosques and places to eat. Yes, you read that right. Feature phones.